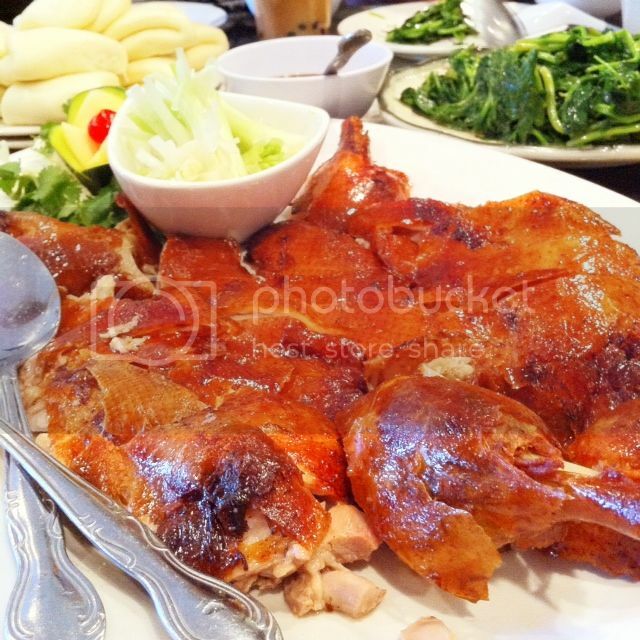 Ever had Peking duck at a Chinese restaurant? This famous Chinese dish requires various steps in the cooking process. Baste with duck juice, roast in wood fire oven, soak in restaurant's secret stock, and coat with sugar based sauce are just part of the work in order to create a juicy duck with fatty yet crunchy skin on the table. Some restaurants offer two to four different ways to devour the duck. First and the most delicious in my opinion, simply wrap the duck skin with steamed buns, add a spoonful of sweet fermented flour paste and scallion, and enjoy all the flavors in one bite. One common way to enjoy the remaining of the duck is heavy seasoned stir fry using the meat. As for the bones, many restaurants use it as stock base for congee, and I'm gonna do the same for my leftover Peking duck! Let's make the stock first. Put the leftover bones along with 2 slices of ginger inside a big pot. Add about 4 cups of chicken stock and 4 cups of water. Bring to a boil then lower the heat to keep it simmer. Remember to skim off any dirty floating bits during the process. Cook for about 30 minutes, or till the stock has been reduced by at least 1/3, 1/2 the most. 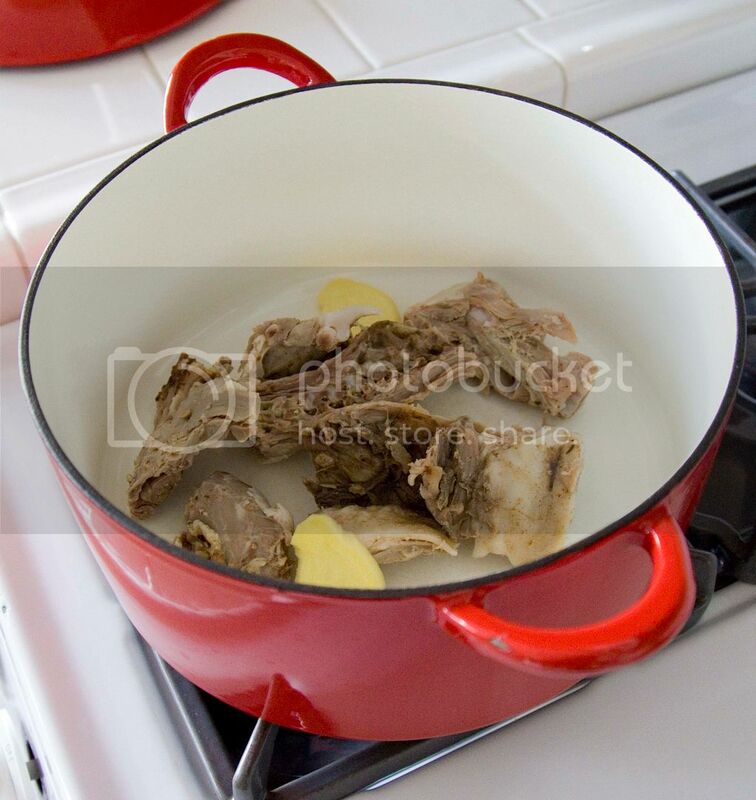 Once ready, drain the soup to another pot and discard the bones and ginger slices. Set the soup aside for later use. I added some chicken stock because there weren't enough leftover bones from just one duck. 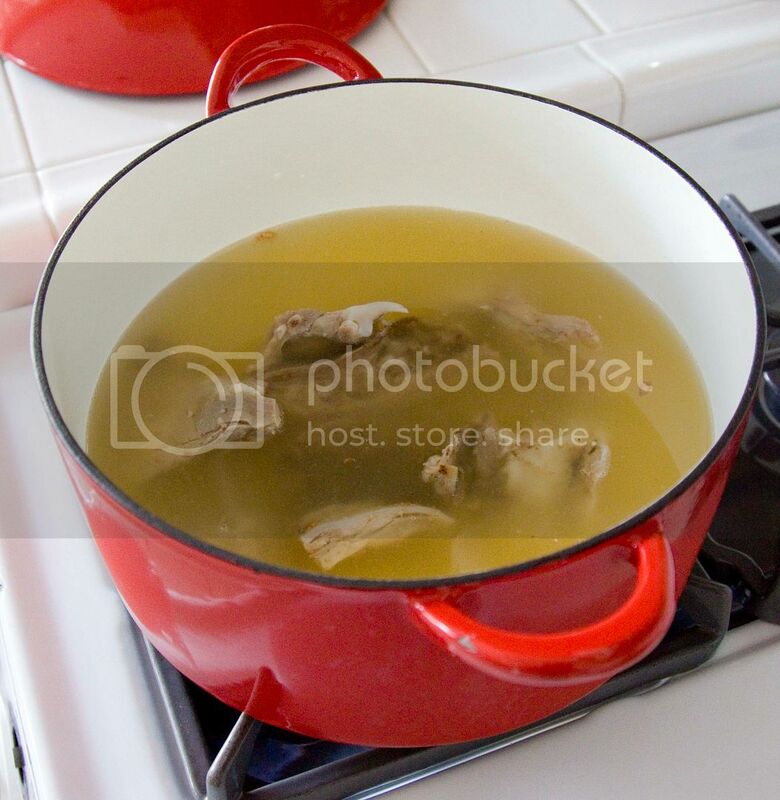 You can use water only if there are more bones to make the stock. Either way, I do think using some chicken stock adds more flavor to this soup base. 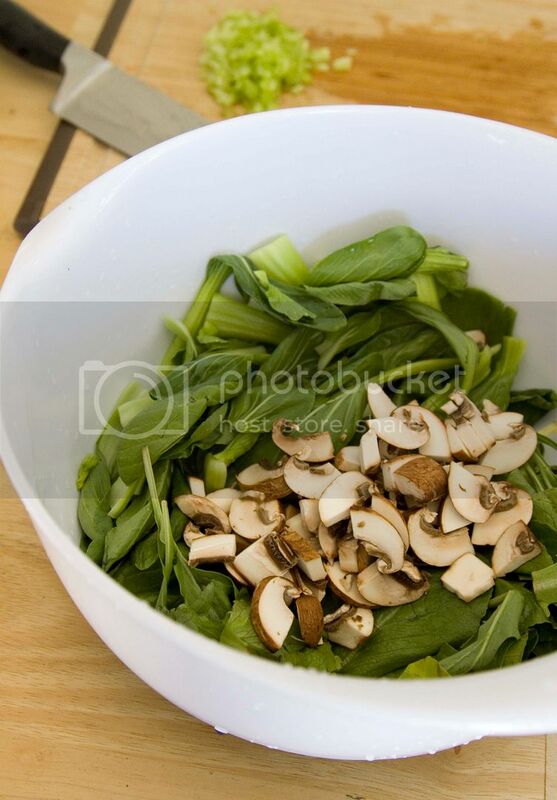 Discard the mushroom stems and chop into small cubes. Chop and discard the bak choy stems, about 1/2 inch in length. Thoroughly rinse the veggies and drain well. There were some leftover mixed salad greens in the fridge so I used that in this recipe too. You can always substitute with other types of leafy greens of your liking. Preparing celery might be tricky. Break the end of the celery and peel it from the bottom till the top from the outer layer. The tough strings should attach to the very bottom section, so when you try to pull through the celery, the tough strings can be removed at the same time. (I promised I'll take a picture of this step to better show you what I'm talking about next time.) Chop the celery into tiny cubes. 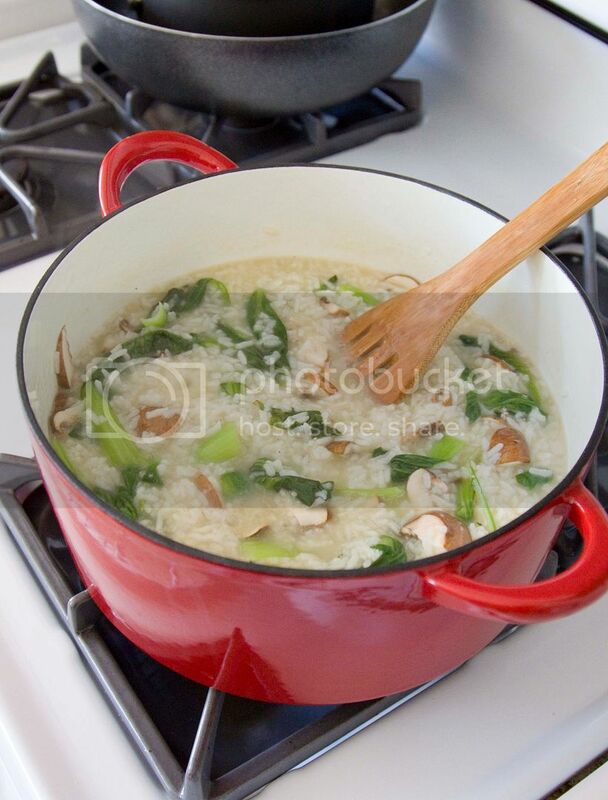 Add the cooked rice into the pot and pour in about half of the stock. Turn to medium heat to slowly bring the pot to a boil. As for the other half of the stock, turn to medium high heat and toss in prepared veggies to cook away the raw tastes. Bring to a boil then turn off the heat. 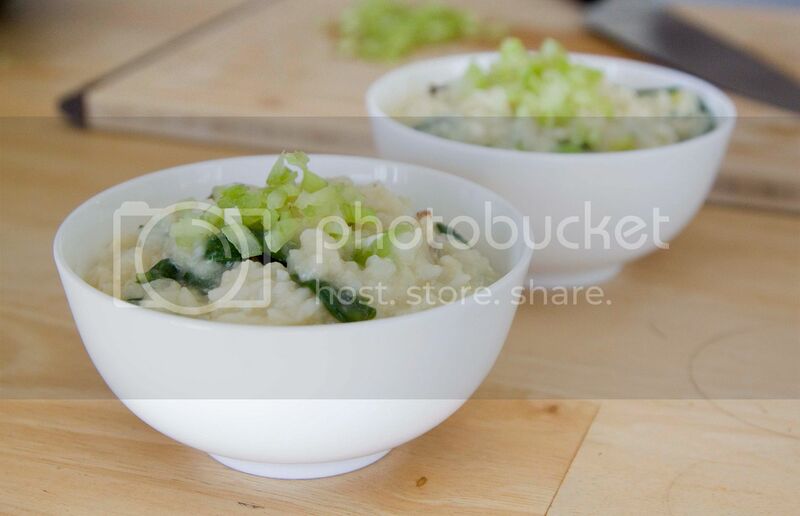 Keep an eye on the rice, add all the remaining stock along with cooked veggies when the rice needs more liquid. Stir the mixture once a while to prevent the bottom from burning. 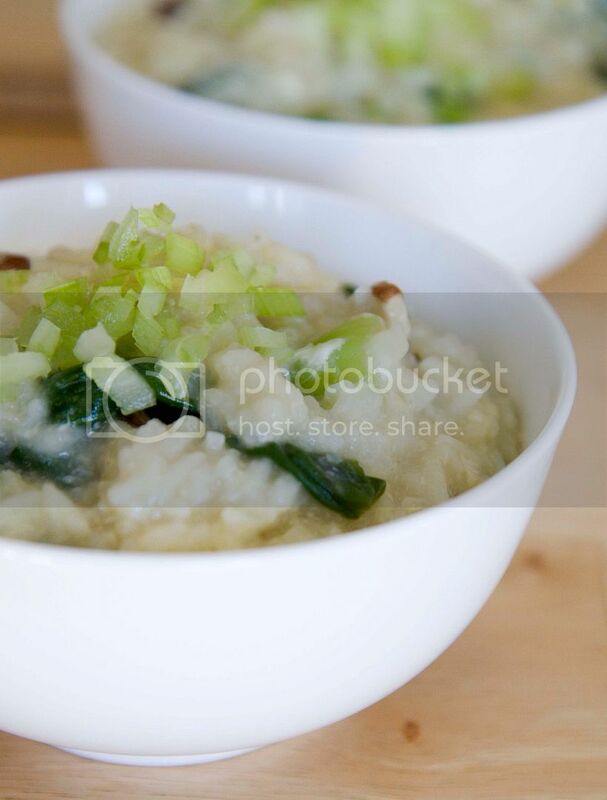 Season the congee with some sea salt and white pepper powder. The amount used depends on the flavor of the stock and the tastes from the duck bones. Just add a little bit at a time to make sure the flavors are right. You can also use just a few dashes of Japanese ponzu sauce if desired. Beat 2 to 3 eggs first then add into the pot. Give it a gentle stir then turn off the heat. 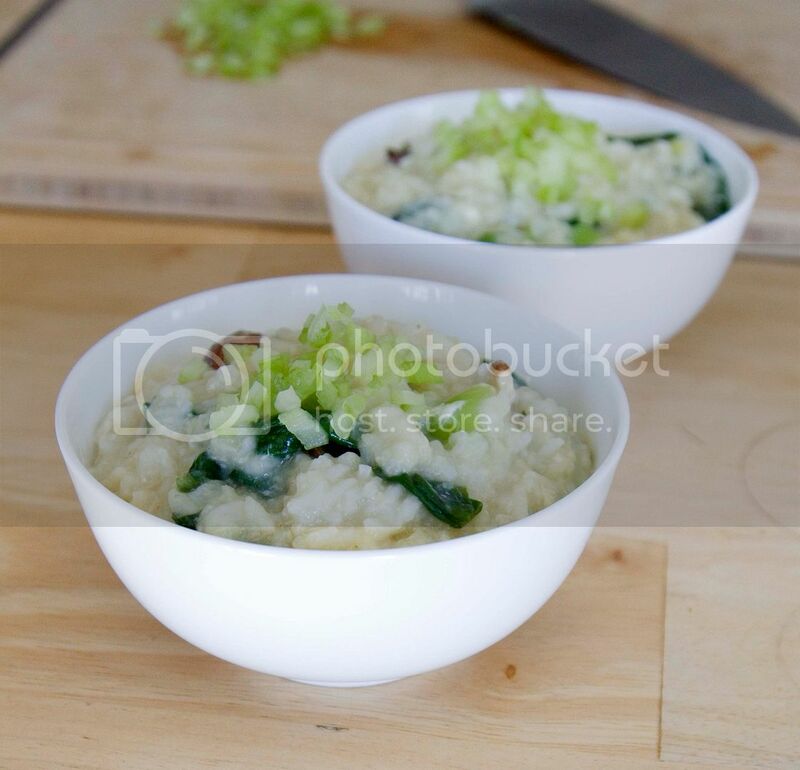 Serve the congee with some chopped celery to brighten up the flavor. The chopped celery here works just like chopped parsley added in the end of some Italian dishes. Leftover makeover, even the bones can be fully utilized! This restaurant doesn't offer other ways to enjoy the Peking duck. So I might as well do it myself, glad you like it! !